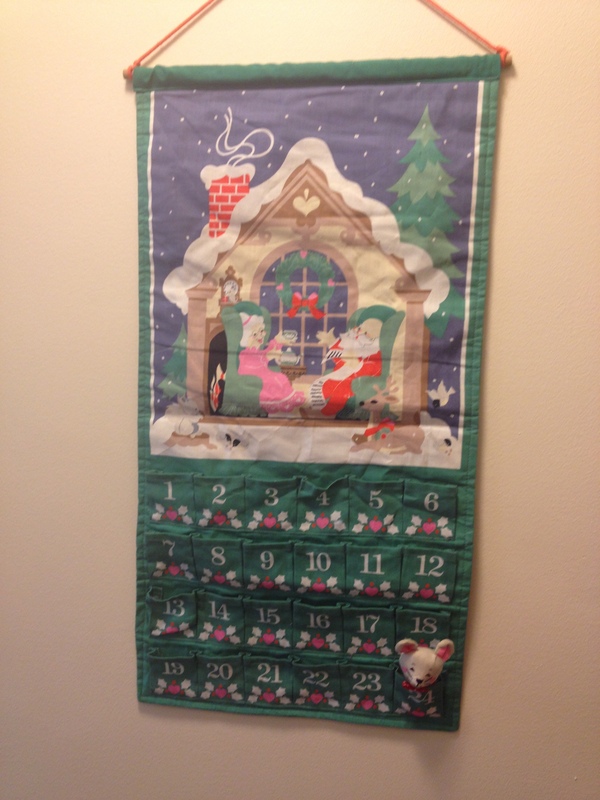 Childhood-Turned-Forever Advent Calendar. Yes, the date-marker is a mouse. I love this thing. Our tree is covered with ornaments that were given to me by dear friends and family at my bridal shower, where one of my genius bridesmaids suggested a Christmas Tree “Wishing Well” in lieu of a traditional one, with guests bringing an ornament instead of a small household item. I have to tell you, not only was I floored by such a thoughtful, useful and beautiful gesture at the time, but it is something I will cherish, remember and relive every Christmas for the rest of our lives. Our tree is topped by a creepy angel that I found in one of the many boxes from my parents’ house, that my husband can’t stand the sight of (which I naturally find hilarious). And I can’t tell you how many times he has asked me, “Where did THIS come from?”, while holding up a random hand-me-down chotchkie- most notably, the two strange Christmas rabbits that we had to put away early because Ellie started barking at them non-stop and we couldn’t take it anymore. I have to say, my favorite bit of Christmas decor this year was actually a happy accident. I was looking around for a card tree and couldn’t find any that felt “right”. 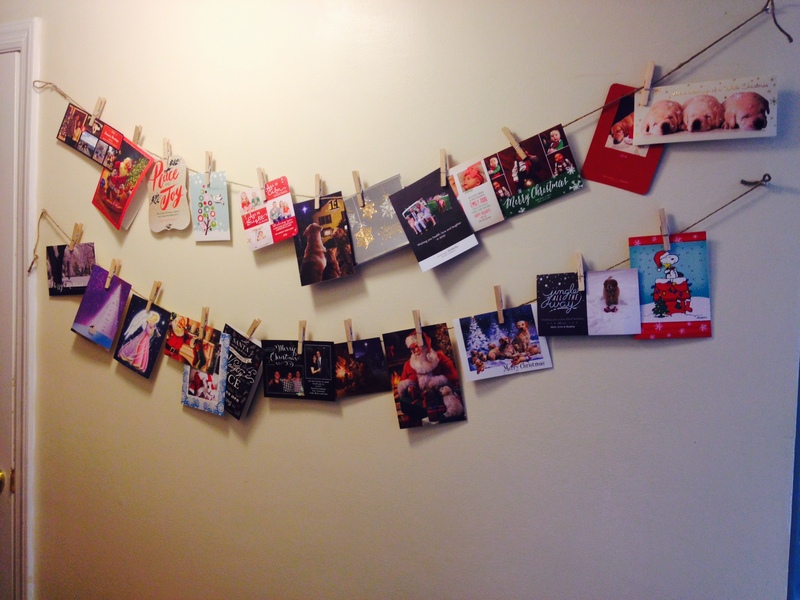 We dug out the twine/clothespins that we used to hang up photos at our wedding, replaced the pictures with holiday cards, and hung them in the hallway as a “good-enough” solution to tide us over for this year. I absolutely love it. I can’t wait to collect cards and hang them proudly in this way for years to come. Our accidental, imperfect card display. And I wouldn’t want it any other way. The tree didn’t turn out the magazine-perfect display of white lights and gold ribbon that I had pictured. One of my husband’s presents was only covered with paper, and not actually wrapped, because I lost the tape on Christmas Eve and gave up. I still haven’t figured out how to masterfully prepare and time several different dishes that require different temperatures and durations in the oven, so I’m sure many of the dishes we served to our families on Christmas Day were lukewarm (or overdone). But, we were surrounded by family. Our home was filled with constant reminders of our loving, supportive family & friends. 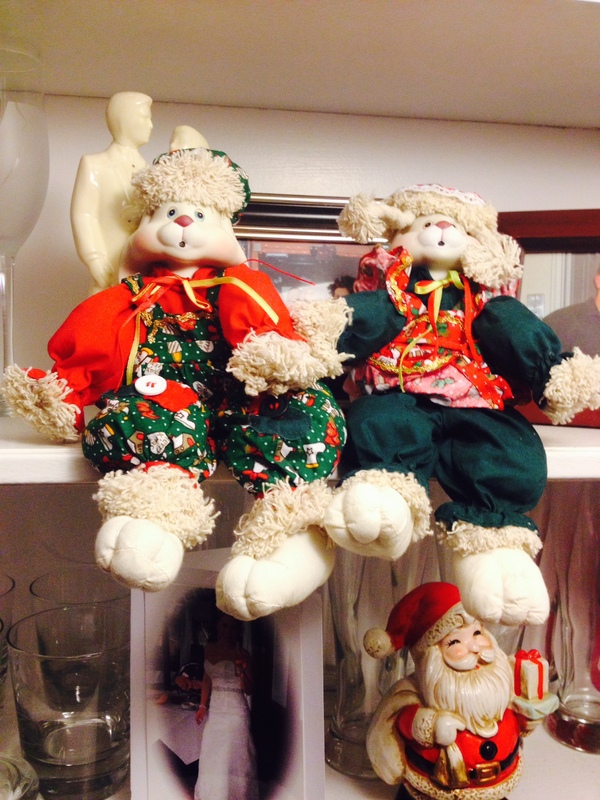 Tokens of Christmas’s past. Promises of Christmas’s to come. We are so blessed. One of my favorite Christmas-movie moments is from “How the Grinch Stole Christmas”, when the Grinch realizes that Who-Ville was celebrating Christmas in the absence of all of the treasures he stole from them. Thank-you, Dr. Seuss, for your words of wisdom, delivered by a scary green monster, that really capture what the holiday season is all about by identifying what it’s NOT about. Wishing everyone a happy, healthy 2015! So I started this blog a long time ago and only managed to write one post. My bad. In my defense, between working on our home, our wedding, going on our honeymoon and getting settled back into a routine (as newlyweds!!!) time has gotten away from me even more than it normally does. 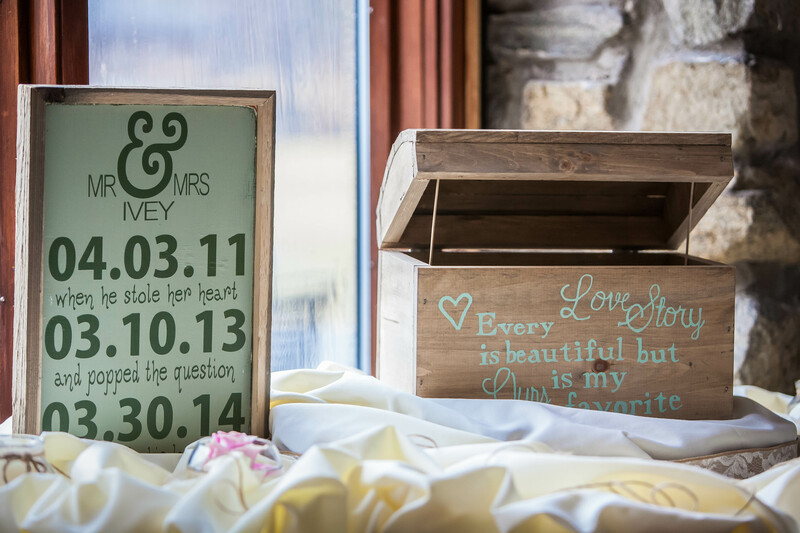 I figured that I would talk about my favorite wedding craft… our card box! I, like many brides-to-be, spent a lot of time swooning on Etsy at all of the beautiful handmade items that might just add a special air of whimsy or romance to my big day. 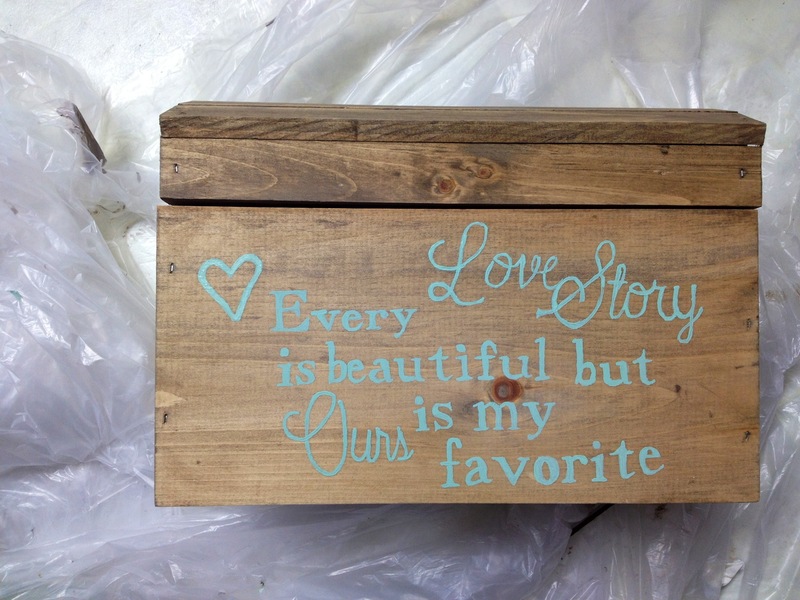 I absolutely LOVE anything that displays a whimsical quote or something of the like, so when I saw a rustic, weathered card box that read “Every Love Story is Beautiful But Ours Is My Favorite” on the front, I was sold. Then… I saw the price. I started looking around and found that most of the card boxes I was finding online ranged from around 80 bucks all the way up to 250 bucks for more intricate designs. I was shocked! The one I fell in love with was listed for around 115 dollars. Despite shelling out the big bucks for certain parts of our budget (we dropped more on photo and video than I was able to scrounge up for a down payment for my car just a few short years ago) I was not going to go overboard on unnecessary details. I’ve never been a particularly artsy person but I decided to hit up the craft store and see if I could make my own version for a more reasonable cost. It was, admittedly, the first crafty DIY project I’ve ever taken on (at least in my adult life!). The glaze calls for 4 parts Valspar clear mixing glaze, 2 parts of the mocha glaze and 1 part of the antiquing asphaltum glaze. I actually just searched google images for the quote, and found a picture of a sign I liked. I originally intended on tracing the outline of the quote and then painting it, but soon discovered that I would have spent the rest of my life doing that, so ended up just eyeballing it. It’s definitely imperfect and I would certainly have to fine tune my skills before opening up my own Etsy shop but I was very happy with the result. The three glaze ingredients ran me about 43 dollars at Lowe’s (the only place I could find Valspar products) and I didn’t have time to shop sales, look for coupons or any of the other tips and tricks I would normally employ. The wood box was 19.99 and the acrylic paint for the text was about a dollar, so all in all I spent around 65 bucks- but I have enough rustic glaze to weather pretty much anything I could think of. So it looks like I have to craft some more… the next project I would like to tackle is refinishing a garage sale coffee table my husband picked up years ago for about 15 bucks- so hopefully I will be posting the end result of that in the near future! The wedding venue: We looked at a few places but we (mostly he, actually) fell in LOVE with the venue where we ultimately booked our wedding ceremony and reception. It was unique, rustic and beautiful. They only do weddings on Saturdays and Sundays, and had very little Saturday availability. So, the fact that we would have had to wait an additional 5 months PLUS spend 10 grand more for a Saturday wedding made the choice to do a Sunday in March (gotta love an off-season “bargain”!) fairly easy. The wedding extras: Being blown off by a florist after telling her I didn’t want to spend more than 3K on flowers (newsflash: flowers DIE!!!). $275 for a BELT. Thousands of dollars on photo and video- some packages only including one photographer! 125 bucks for the stupid rustic card-box I fell in love with on Etsy?! 1100 dollars for up-lighting?!?! Everything wedding seems to be impractical and over-the-top. We prioritized and did splurge in some areas, because it is hard not to get carried away with certain details for your wedding. However, we were shocked to find out that booking our venue would not be the most taxing part of the wedding planning process, and decided that we would not spend needlessly outside of the things that we thought mattered (food, drinks, music and photography!). The house: We had a long house-hunting process. 8 months of looking at houses, putting in offers, and enduring bidding wars. We were some of the lucky ones who entered the real estate market just as it was shifting from a buyer’s to a seller’s- every single house we bid on had multiple offers, and each sold for over asking price. We actually offered 10K over asking on a house and ended up being outbid by 35K! It was stressful, and seemingly endless, until we finally found our little home near the park that is absolutely perfect for us! I’ll be posting a lot more on our house in later posts, but it’s a modest home in a great neighborhood that was the perfect balance of “move-in-ready” and “room for improvement”. We experienced a lot of sticker shock at what we could get for our money in such a desirable area, but in the end didn’t let ourselves get caught up in the stress and made a decision that made sense from both an investment and lifestyle standpoint. The moral of the story is, especially in this day & age where everything gets posted on social media and people have something to say/judge about every nuance of life, it’s easy to get caught up in things that really don’t matter. I’ve decided to start documenting some of the projects we’re taking on to build the life we’ve always dreamed of together, without completely breaking the bank. Feel free to share in our journey! We believe that we can do it with lots of love… and a little elbow grease.